Exhuming this thread with some pictures and queries fitting here. "Black sallet. Southern German, circa 1490. A light helmet forged in one piece with a widely extended skull and lightly pulled-in sides. The ridged neck protector coming to a point. Clearly visible hammer marks. There is minor damage both at the left temple and on the right side. The smooth visor (possibly replaced) has a broad eye slit and opens upwards. The hinges have crenellated edges and embossed decoration. There is a spring latch on the right side. Surrounding lining rivets with remnants of the original leather. Visor and skull are surrounded with double holes for attaching a fabric cover. On the inside an old label from the Leichtle collection in Kempten, as well as the engraving "IKL" (Iohann Leichtle Kempten). Attached collection label from the Kempten City Museum, where is was on loan from 1946 - 2006. Height 21.5 cm. Length 45 cm. Weight 1580 grams. Cf. a nearly identical example in the Kunsthistorisches Museum Wien illustrated in Howard M. Curtis. 2500 Years of European Helmets, pp 172 f."
It was up for auction on Hermann Historica recently, went for 30000€ if im not misstaking. What im looking for is any better pictures of this one, and any further info. This is my first post. 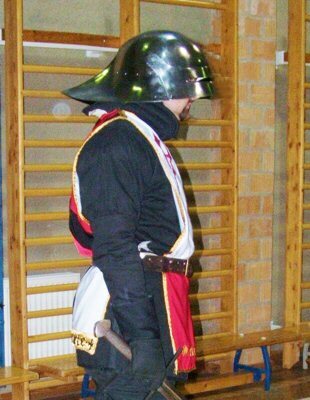 I'm Szabolcs Waldmann from the Order ofthe Sword, a Hungarian medieval fencing group. I would like to contribute to this forum; I have two pictures for you, taken at the Vienna museum. This is the Black Sallet there, you wrote about. It's strange tough, they call it "Grosser Schaller". And, I have a question as well. You see, I would like to have my armourer making a copy of the Black Sallet Mr. Stilleborn put online (Great! Wonderful!). But... How were these worn? I own a gothic sallet, the "usual" style, which can only be worn one way. These, espetially the one opening this thread, are far to big. And, the eyeslids look slightly upwards, so I have the feeling that the warrior looked UNDER the visor, and probably pulled the whole helmet forward, if he wanted to protect his eyes. But then, the tail would go up way to high! The only position I can imagine such a helmet being in good position is while riding a horse fast, leaning forward. And besides, the eyeslids are far from the face as well. And why an opening visor, then? Has anybody any idea? I mean, some of this things were over 40 cms long! On my dead hd I had a series of images derived from a russian website showing one of them with its liner in a decent shape for its age, pity they are gone. I wonder how important it was to keep in place such a strange helm with so narrow slits. Just a little sliding movement and the carrier of such an helmet sees nothing anymore, I guess. 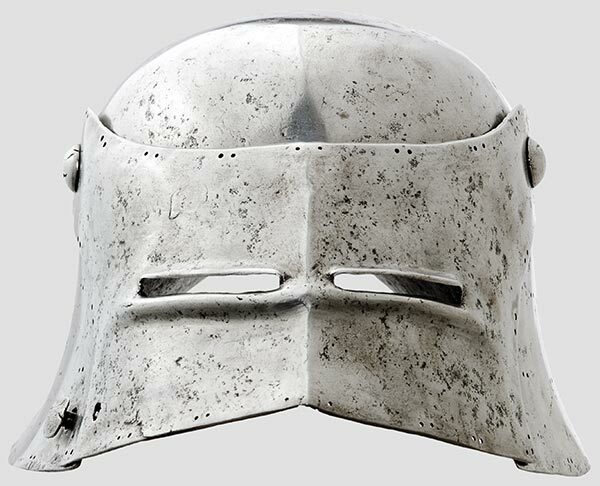 Is there any evidence of painted bascinets of other helmets circa 1380 - 1415? There is certainly iconagraphical evidence for bascinets being coloured a bit earlier in the 14th century. There are several period illustrations of coloured bascinets, kettle hats, and even earlier helms in Pamela Porter's Medieval Warfare in Manuscripts. There are some kettle-hats and a visored helm or two coloured red (or russet) in the scene of knights engaging in battle from the Holkham Picture Bible Book of 1326-27, Add Ms 47682, fol. 40. There are blue, green, and red coloured helms and kettle hats in a tournament scene from Harley MS 4389, fol. 26. , circa 1300. There are red and gold coloured simple bascinets shown on warriors in a siege scene from Royal 16 GVI, fol. 74, of circa 1325-1350. Another scene from the same manuscript (fol. 345v) shows gold and red bascinets. There are red, blue, gold, and even a red-blue striped (horizontally) helm in the Yates Thompson MS 12, fol. 40v of circa 1250-1260. It's hard to say for sure whether these helmets were painted or covered in fabric. In The Armourer and His Craft, Charles ffoulkes devotes a chapter to "The use of Fabrics and Linen". In one section, he comments on how the covering of helmets seems to have been common in the first years of the fourteenth century. In "Appendix A", ffoulkes presents a 1322 regulation from the records of the Armourers Company, London, that specified that no armourer should attempt to sell bascinets covered in fabric, but should show them bare so the workmanship could be examined. 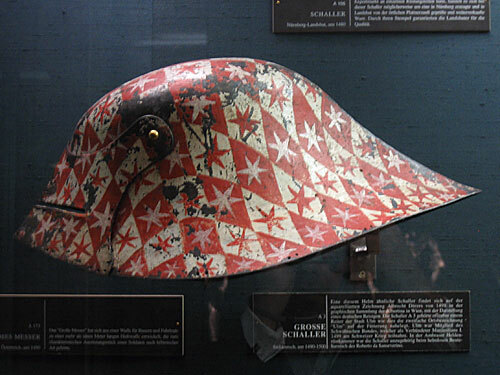 I suppose the helm striped in blue and red from the Yates thompson manuscript could have been covered in a striped cloth, but that one may represent a painted helmet of the mid 13th century. I hope this helped a bit, even though it's a bit earlier than the late 14th century. The LIBER AD HONOREM AVGUSTI (1196 features illuminations with several painted helmets: the colors of the helmets do match that of the shields. Thanks for the links! Neat pictures! Nice painted nasal helmets! I was thinking about the practicality of covering a great helm, like that shown in the image of a striped helm from the British Library, in fabric. That helm appears to be completely covered in the design of red and blue stripes. If it was fabric, I would think it would be extremely difficult to cover the face-plate with all the breaths. I think it would be tricky to get the perforations in the fabric without the fabric being likely to fray or rip. I would interpret that helm as being painted. It seems more likely in that particular case. 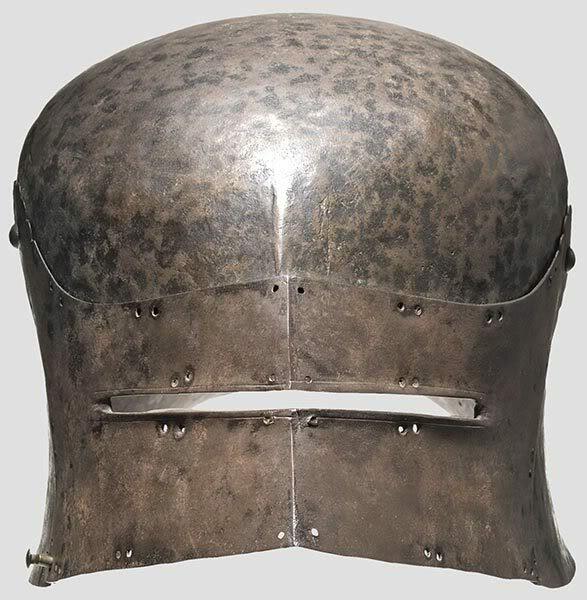 I mentioned fabric-covered helmets because there is definite proof that early-fourteenth century bascinets were covered in fabric, as per the regulations cited in The Armourer and His Craft by Charles ffoulkes. For these earlier helmets, painting is certainly a viable option. The painted of helmets certainly does not seem to be restricted to the fifteenth century. 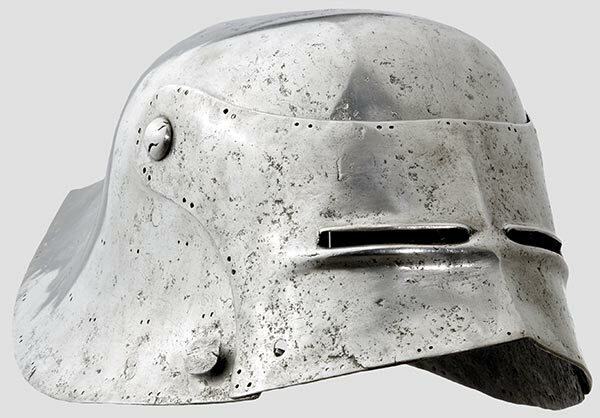 "German black sallet, circa 1490. Skull forged in one piece with a long ridged neck protector. Movable visor with two separate eye slits surrounded by protective ridges. A spring-loaded latch on the right side. Lining rivets around the inside. The rim and the sides have numerous double holes for attaching a missing cloth cover. Height 19.5 cm. Length 49 cm. Weight 2503 grams." A sidenote is that this "black-sallet" is the whitest helmet ive ever seen! Hello, i'm glad to find this Forum with really good pictures from black sallets. I have heard it belongs to the Royal Armouries in Leeds. Do someone have another pictures from this sallet, maybe from the front, back and upside, or do have connection to the Royal Armouries, I would pay for good pictures . Gernot, would you please note that your image 165 (This one) was a photograph taken by me. I'm currently working on getting an official gallery up of my photo collection from the Kunsthistorisches Museum, but some of my pictures have started circulating without credit. I would like this to be done as little as possible. Thank you. One can safely assume that most if not all of these helmets were left scaly black and rough from the hammer. The state the polished specimens are in suggests they have been polished some time later, presumably in the 19th century. The Munich specimen looks thin like tinfoil. I am pretty sure a piece in a very bad state of conservation has been overly polished by some 19th century curate in order to turn it it into yet another shiney knightly helmet. 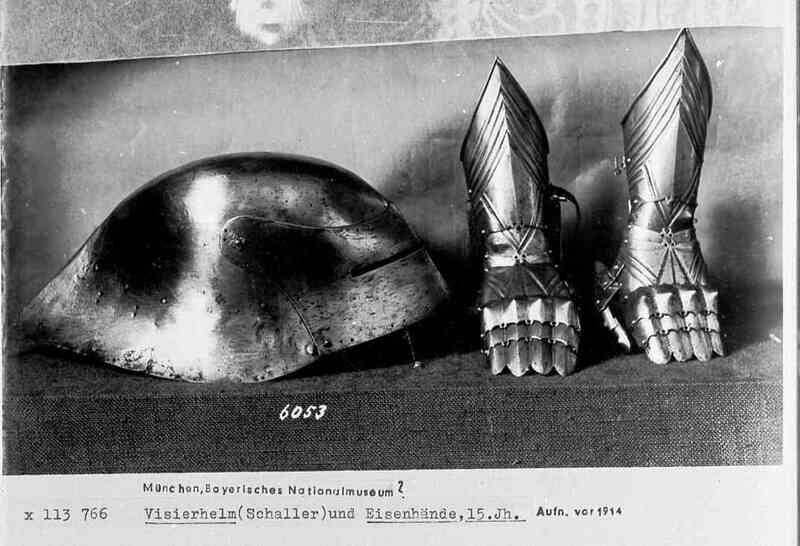 Same goes for the two sallets from Herman Historica. Not only do these helmets look odd- they are odd. Most of the were worn like kettle hats or morions, the visor serving more or less only as a decorative element. If you pulled the helmet down that you could look through the visor´s slits, the rear would stand up at a grotesque angle. 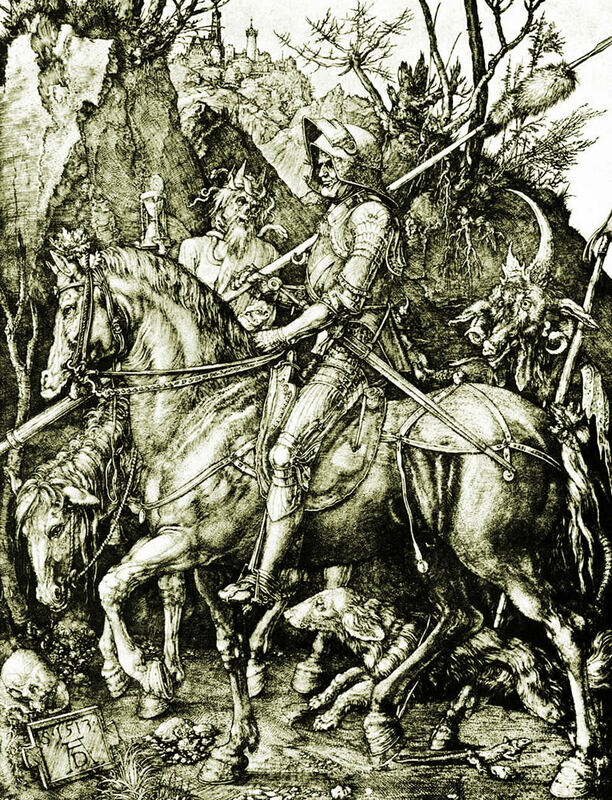 Have a close look at Albrecht Dürer´s engravings and the preliminary sketches to "Knight, Death and the Devil", or at contemporary work by Israhel van Meckenem and others- their sallets look out of shape. The tail protects the neck, the skull conforms more or less to the wearer´s head, and the lower edge of the visor protrudes around the wearer´s face like on a morion or a late kettle hat. These helmets actually are worked in the shape of a roughly shaped, tilted- back sallet, just like the pseudo- corinthian helmets of antiquity that sported all features of the classical corinthian helmet, cheekpieces, nasal and all, only that they were worn on top of the head like a tilted- back corintihian helmet. one can wear either low were the eye slot is used to have a view of what is in front of one through the eye slot but also both can be titled back on the head were one can have an unobstructed forward view. ( With the sallet one can also lift the visor ). An observation: When tilted back the eye slot gives a view of things at a high angle like a blow coming from above or a missile coming in. So even when not in front of the face the eye slots can have some secondary use. So these types of helms have a range of uses giving more or less situational awareness versus more or less protection depending on how they are worn: Strait or tilted back. They actually were functional- in that way that you could flip them up and down, and many even had fully functional locking pins. But the position of the vision slits is way off. If you pull them right in front of your eyes, so that you can look through them, the tail of the helmet will point to the skies at a ridiculous angle. 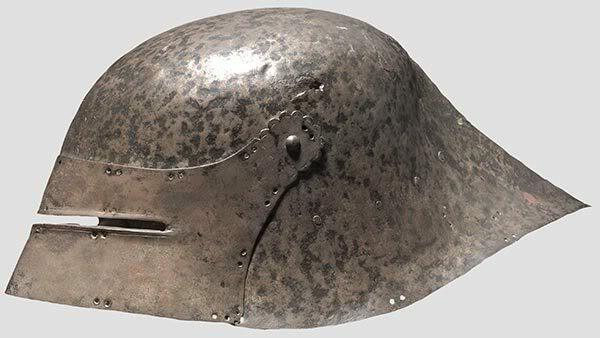 If you tilt the helmet back so that the tail actually covers your neck in a sallet- appropriate way, the slits are "somehwere up there", the lower edge acting as if it were a down- turned brim of a kettlehat. 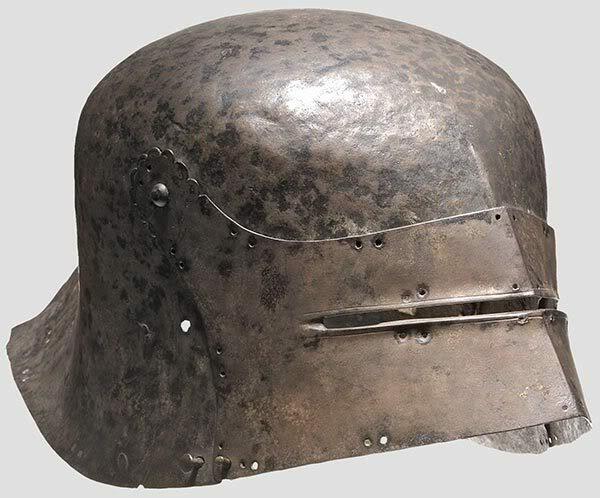 That´s one of the characteristics of this special type of sallet, believe it or not. Yes, the helmet is generally a good one used as a kettlehat with a bevor. Looks great, feels great. But when I take an armoured stance for halfswording, the eyeslits are in a good position to see through them! And while fast riding (charging? ), this is the case as well, the tail protects the neck while the exeslits get to the right place. There is another possible explanation I heard, that these openings were in use during sieges, while climbing a ladder. Sadly, there were not so many actual stromings of fortresses, when it came to a siege. So this is not so likely in my opinion. Ha anybody the three different photos from the yellow-flamed one from the 2001 auction? Hummm...looks like an early wind dynamics at work here? If by rifles you mean arquebuses (short-barelled smoothbore matchlocks) then no, it's not too early. But I've never seen any evidence of arquebusiers using helmets like this. They are usually shown using open faced sallets, milanese style. There is no point in using a visored helm while aiming from a long distance.